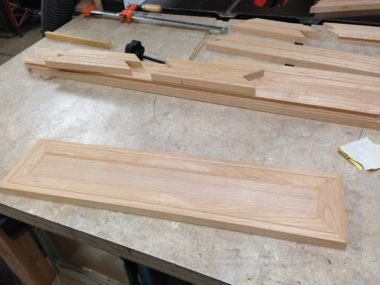 I planed a bunch of maple to 5/8″ thick my drawer thickness. I went with 5/8″ instead of 3/4″, since my top drawers should appear more “dainty” as they are small. I should have done 3/4″ for my larger bottom drawers, but it is too late for that decision. 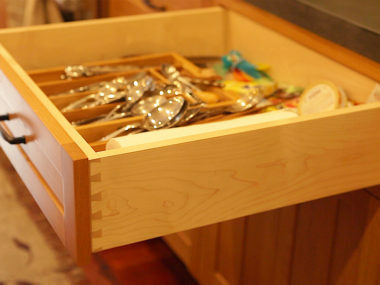 Since these drawers are small, I used 1/4″ maple ply (with a MDF core) for the bottom. My larger drawers will have 1/2″ ply bottoms. The drawer dovetails weren’t as tight on these…I must have messed up the jig a bit, or not done enough practice cuts on it. They did turn out pretty well, and I can clean them up. I now have to get more maple for two more large drawers, and then I’ll be done building them all.